The more I learn, the more questions I have. For me, the spiritual quest will be a life-long work in progress. Daniel Gerhard Brown (born June 22, 1964) is an American author of thriller fiction, featuring recurring elements of cryptography, keys, symbols, codes, and conspiracy theories. See also: Angels and Demons, The Da Vinci Code, and The Lost Symbol. Interestingly, if you ask three people what it means to be Christian, you will get three different answers. Some feel being baptized is sufficient. Others feel you must accept the Bible as absolute historical fact. Still others require a belief that all those who do not accept Christ as their personal savior are doomed to hell. Faith is a continuum, and we each fall on that line where we may. By attempting to rigidly classify ethereal concepts like faith, we end up debating semantics to the point where we entirely miss the obvious — that is, that we are all trying to decipher life's big mysteries, and we're each following our own paths of enlightenment. I consider myself a student of many religions. The more I learn, the more questions I have. For me, the spiritual quest will be a life-long work in progress. If I'm not at my desk by 4 AM, I feel like I'm missing my most productive hours. In addition to starting early, I keep an antique hour glass on my desk and every hour break briefly to do pushups, sit-ups, and some quick stretches. I find this helps keep the blood (and ideas) flowing. I never imagined so many people would be enjoying it this much. I wrote this book essentially as a group of fictional characters exploring ideas that I found personally intriguing. Secrets interest us all, I think. Google is not a synonym for research. I am not an atheist — I think I'm happily confused and a work in progress; I'm sort of more agnostic. I do think that science has become the lens through which we see the world, more and more. 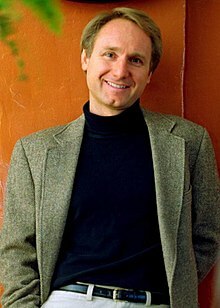 Dan Brown has to be one of the best, smartest, and most accomplished writers in the country. The Da Vinci Code is many notches above the intelligent thriller; this is pure genius. The world of publishing is in crisis. It's no coincidence that the worst published writer in the world today is also one of the world's most successful writers... Dan Brown. Now Dan Brown is not a good writer, The Da Vinci Code is not literature. Dan Brown writes sentences like "The famous man looked at the red cup." …and it's only to be hoped that Dan Brown never gets a job where he's required to break bad news. "Doctor is he going to be alright?" "The seventy five year old man died a painful death on the large green table... it was sad". Do not start me on The Da Vinci Code … a novel so bad that it gives bad novels a bad name. … Even Dan Brown must live. Preferably not write, but live. Critics have found in the narrative a veneer of erudition that cloaks nothing more than a James Bond-style romp, albeit a highly addictive one. His publisher has described it as 'a thriller for people who don't like thrillers'. One newspaper put it thus: 'It is terribly written, its characters are cardboard cutouts, the dialogue is excruciating in places and, a bit like a computer manual, everything is overstated and repeated — but it is impossible to put the bloody thing down. The Dan Brown Code - In a court filing, the best-selling author of The Da Vinci Code reveals all the secrets of a pulp novelist. Australia's Courier Mail, January 12, 2006, "New e-book offers readers more time"
Summary of Judgement - April 7, 2006, Court's ruling on copyright infringement of "Holy Blood, Holy Grail"